HRYHORIV — The church of St. Demetrius is the second church of the parish. The first church was constructed in 1907. “Nevertheless, that church didn’t have domes like the churches in the Old Land and this bothered our parishioners. They began to collect money for a new church and in the end constructed it . . .” (Prop. Knyha p. 246). The second church was constructed in 1932 during the pastorate of Rev. Peter Kryworuchka. The parish was visited by Bishop Nicetas Budka in 1914 and 1918 and by Archbishop Basil Ladyka in 1933, at which time he also blessed the church. Bishop Andrew Roborecki celebrated a solemn Divine Liturgy in the church on June 11, 1964. 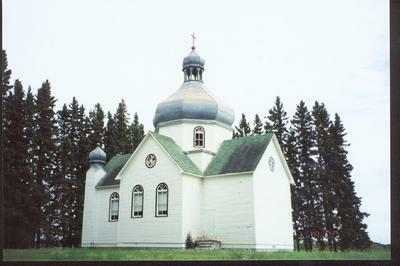 The church is a wood constructed cruciform structure, 36 x 56 feet, with one large central dome and two smaller cupolas above the frontal towers. Its interior and exterior walls are finished with narrow wood siding and are painted a light color. In the interior the elevated sanctuary contains the main altar behind which hangs the large painting of the church patron; an adjoining sacristy is on its right. On corresponding sides of the sanctuary along the lateral walls of the nave are two small side altars traditionally dedicated to the Holy Mother of God and Christ Who Loves Mankind; these holy images are glass mounted oil prints. A choir loft extends over the vestibule and part of the nave and is reached by a stairway originating in the nave. The church is dominated by a vaulted ceiling and a large central dome illuminated by four windows. It contains wooden pews seating approx. 80 persons, is lighted by candles only and is centrally heated by a wood burning heater. The parishioners constructed the church through their contributions, costs totalled $2,300, and voluntary work was under the foremanship of Wasyi Huziak. The four acre church and cemetery site was donated by Marko Gulka. Near the church stands a cross commemorating the Holy Mission of 1933. A church bell mounted on posts is also nearby; it was purchased in 1911 for $40. Kyrylo Dmytriw, Stefan Koniukh, Pavlo Shpak, Pavlo Shalansky, Pavlo Stachew, Leontiy Yatsyshyn (Ya-cishyn, Yacyshyn), Marko Gulka, Karpo Gulka, Zak-har Melnychuk, Vasyi’ Dmytriw, Yakiv Dmytriw and Dmytro Babak. In 1941 the parish numbered 40 members with 90 children (Prop. Knyha); in 1961 there were 45 souls (Directory), in 1967, 16 families and in 1975, 12 families were accounted for. 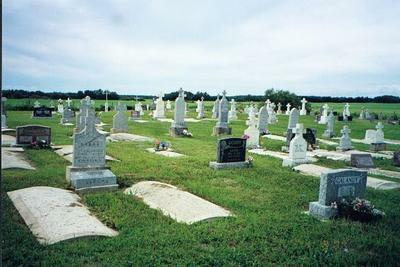 The founders of this parish are gradually passing to eternal rest while their Canadian born children are leaving the community for education and job opportunities in larger cities. In 1976 the parish was under the directorship of Rev. Casimir Kucharek, acting pastor for the pastoral district, Steve Shuya and Steve Gulka. 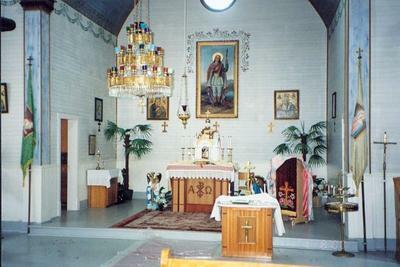 The Ukrainian Catholic parish of St. Demetrius, Hryhoriv, is under the pastoral charge of Preeceville. The name “Hryhoriv” is of Ukrainian origin from the village of Hryhoriv in the Buchach county. The parishioners constructed the church through their contributions, costs totalled $2,300 and voluntary work was under the foremanship of Wasyi Huziak. The four acre church and cemetery site was donated by Marko Gulka. Near the church stands a cross commemorating the Holy Mission in 1933. A Church bell mounted on posts is also nearby; it was purchased in 1911 for $40. The first Ukrainian settlers in this area arrived in 1902 from the village of Hryhoriv of the Buchach county and so named their parish. The first holy services were served by the Redemptorist Fathers as early as 1903. Initially they were held at home of Pavlo Shpak and Marko Gulka and from 1907 in the newly constructed church. Officially the church is now closed (having service just once a year), so the Hryhoriv members worship and belong also in the Preeceville church.